It’s 1928 in Melbourne and Phryne is asked to investigate the puzzling death of a famous author and illustrator of fairy stories. To do so, Phryne takes a job within the women’s magazine that employed the victim and finds herself enmeshed in her colleagues’ deceptions. But while Phryne is learning the ins and outs of magazine publishing first hand, her personal life is thrown into chaos. Impatient for her lover Lin Chung’s imminent return from a silk-buying expedition to China, she instead receives an unusual summons from Lin Chung’s family, followed by a series of mysterious assaults and warnings. I liked this so much better than the TV episode inspired by this book. This was deeper, richer, and more complex. "Away with the Fairies" refers to the murder of a writer who specialized in writing and illustrating fairy stories. There's quite a cast of people, both at the magazine and in the community where she lived. Despite the murder, it's a genteel sort of mystery with little danger but lots of period detail, and quiet investigative work. Then there's the second mystery involving Lin Chung and his family. That one was darker, more personal, and full of action and adventure, betrayal and greed. It made for an interesting contrast with the other story line, which was so quiet and, well, civil. Lots of good manners, and the occasional lie,whereas Lin Chung's story line was more dangerous and emotionally volatile. It was a good reminder that Phryne is not just some society dame or a flibbertigibbet (though anyone who accused Phryne of that would need to have their head examined) but a strong, passionate devoted woman who takes what she wants, protects what's hers, and has her own moral code. I enjoyed the contrast between the two storylines, once I got over my initial surprise. I have mixed feelings about Phryne and Lin's relationship, as he is taken and Phryne has other lovers, but I have no doubt that they love each other despite their free-spirited arrangement. I really need to read this series on order to better appreciate their romance and relationship. "Away with the Fairies" is a meandering story about family, love, devotion, and choices amongst other matters. 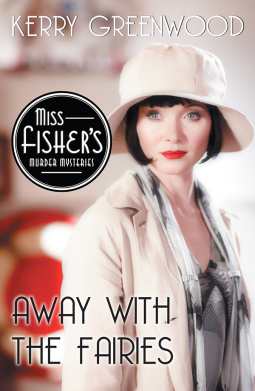 It mixes light and dark, philosophy and fashion, a sometimes careless approach to life with a passion for doing the right thing, as determined by Phryne. It's history, romance, passion, fairies, war, and frivolity. It was engaging if slow at times and a delightful return to Melbourne of the 1920s. This is a series that I really enjoy but kind of forget about. I love the sound of the mystery in this one and I'd love to spend more time with Phrynne. It's good to know that the episode doesn't quite live up to the book. I'll read the book first!